Tell us a little bit about the history of Thrasher? My parents started the company in 1975 as a waterproofing company. As they saw other problems homeowners faced, they introduced new services to meet those needs. Today, our 250-person team offers a suite of services to residential and commercial clients in Nebraska, Iowa and Missouri. We focus on providing every customer with cost-effective solutions and a level of satisfaction unsurpassed in industries we serve. As such, we always look for cutting-edge solutions to make projects less stressful for our customers and our employees. Often times that means doing little things every day to improve our processes. Occasionally it means taking larger actions to reach that goal. We are not afraid to make the needed investments in equipment, personnel, processes or training to get the job done. For example, we were not completely satisfied with the foam we were purchasing for concrete leveling projects, so we started manufacturing our own foam which we currently market to other contractors. How did you get into the concrete business? Concrete was a natural extension to our waterproofing business. We started with concrete leveling work to get water running away from properties, but many of these projects required us to replace concrete. Rather than rely on a subcontractor for these jobs we started doing our own concrete work. What challenges did you face as you got into the concrete business? The biggest challenge was control. As I mentioned earlier, one of the keys to our success is meeting customer expectations. We wanted to control the quality of the concrete we were pouring to assure customers of the best possible product. At the same time, we didn’t want to be captive of a ready-mix operator’s schedule to deliver concrete. We wanted to control our timing on these projects and to eliminate any wasted concrete that would add costs for us and our customers. We soon realized that type of control would only be possible if we could produce our own concrete when and where we needed it. After talking with several people in the industry, we quickly realized volumetric mixing was the only way to go! What lead to your decision to purchase a Cemen Tech unit? • First of all, it met our prime objective — to be able to control the quality and timing of concrete production. • The unit could be easily calibrated for flatwork, shotcrete, cellular and other types of mix we would be using. 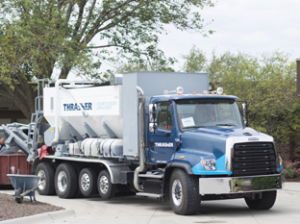 Although it costs us more to own our volumetric mixing equipment and purchase and store the needed ingredients, we are able to control the waste and our schedules so we can complete the job without charging our customers any more than if we relied on outside vendors to deliver concrete. More importantly, the quality of the finished product meets our exacting standards. And as I said before, that’s the key to our success. Do customers care whether the concrete is produced on site or delivered? Most people don’t understand the science of concrete. 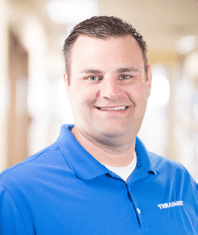 But we have found that when you share the story of volumetric mixing and our ability to make it in a way that will get the job done on schedule and on budget and with better results, they find it interesting and quickly become our best salespeople. What does the future hold for your concrete operation? When we began using the Cemen Tech unit, we anticipated pouring 30 to 40 yards a week. We have almost doubled that projection in the first eight months of operation and hope to continue that growth as we pursue more flatwork in the future. What advice would you give to others about being an innovator? First of all, you have to have a vision of what you want your company to look like in the future. We were not satisfied just being another owner-operator relying on outside vendors to get the job done. Using volumetric mixing on the jobsite is just one example of the way we continue to look for opportunities to differentiate ourselves from the competition by delivering exception quality and service. Being an innovator means taking risks, but the pay off is being able to control your destiny. 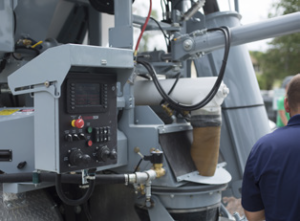 Find out how you can get the competitive edge with volumetric mixers,contact a Cemen Tech Concrete Solutions Specialist or call 800.247.2464. PreviousPrevious post:Mobile Batch Plant vs. Traditional Batch PlantNextNext post:What is a mobile concrete mixer?